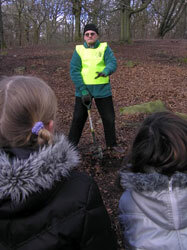 The Friends of Judy Woods are keen to encourage the educational use of Judy Woods by local groups and schools. 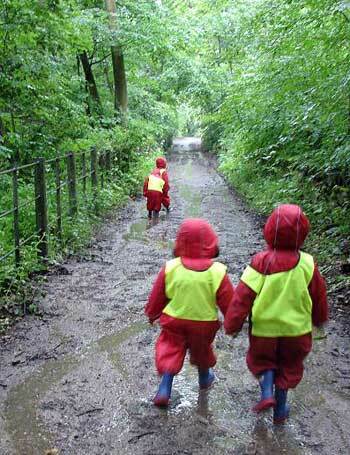 While walking through the woods you may have seen groups of children dressed in wellington boots, red puddle suits and yellow tabards, with two teachers. Did you wonder what they were doing? Well they come from local childrens’ centres at Wyke and Little Horton. The teachers there are training to be qualified Forest School teachers. 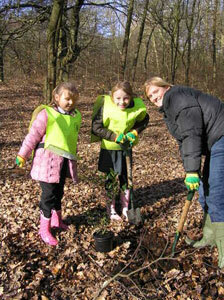 Forest Schools is an idea that has come from Scandinavia. In those countries all primary school children regularly spend time outside in the forests doing various activities, similar to scouting. 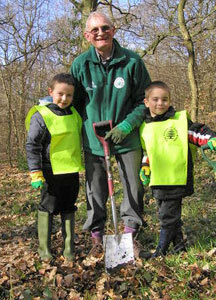 This helps to develop children’s physical skills, social skills, confidence and appreciation of nature. It was found that this then went on to improve their academic achievements. Forest Schools started being introduced to Britain in the 1990s and they have spread to many parts of the country, particularly in Wales. Now it is Bradford’s turn and a group of us started training last February. 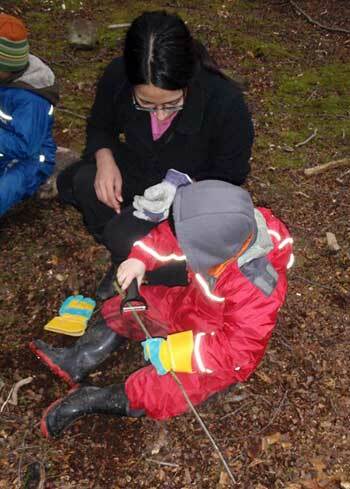 We are taking the Level 3 Award, which will qualify us to run a Forest School at our childrens’ centres. 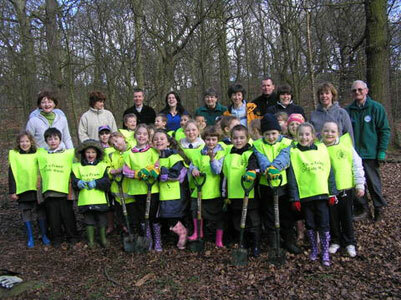 In March 2008, classes from seven local primary schools planted about 1500 trees in Judy Woods. 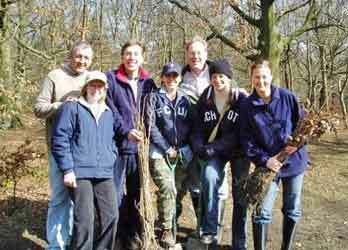 If our calculations are right, we have planted about 10,000 trees since the Friends group was formed. planting a tree. Pat with Olivia and Jack. Lucy and Elizabeth. 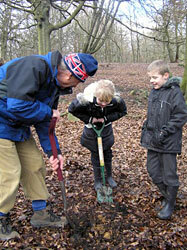 In February and March 2007, six local primary schools (Hill Top, Woodlands, Shirley Manor, Worthinghead, High Fernley and Low Moor) have planted nearly 1000 saplings (a mix of holly, field maple and oak) in Judy Woods. All the children were encouraged to come back and watch their tree grow. Each child was awarded with 'The Friends of Judy Woods' badges for their hard work. Local primary schools have received an educational CD-rom relating to Judy Woods (linked to the National Curriculum), which has been funded as part of the Roots of Judy Woods project. 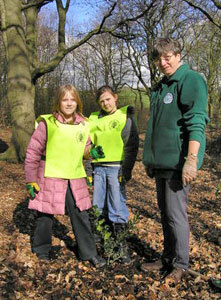 The Friends of Judy Woods went to collect about twenty five oak saplings from this scout group, which they had grown from seed. 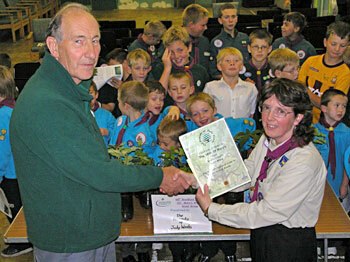 The scout group were presented with a certificate, badges and copies of the latest newsletter. 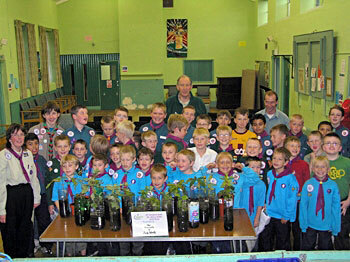 The scouts hope to grow more. 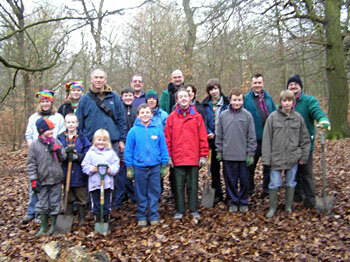 The Scouts then came in the woods on the 5th February 2006, to plant the oak saplings that they had grown. 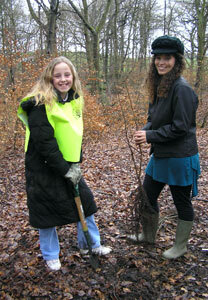 They also planted some other saplings and cleared some beech regeneration. This work helped increase the biodiversity in the woods and has been done with agreement from the Bradford Council's Parks and Landscapes Service, who manage the woods (below). 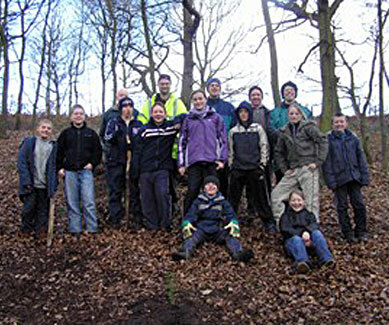 This group cleared some small beech and planted a mix of holly, oak and hazel at the start of March 2006. 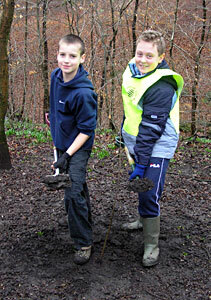 Andrew Elphee plants a tree Wibsey scouts, job done! 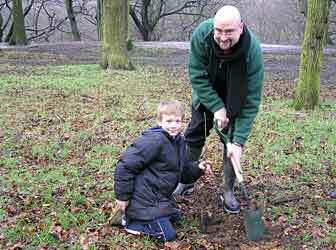 Thousands of tree were planted by businesses, groups and schools with the help of Royds Neighbourhood Environmental Action Worker, Jason Kerry. Two local schools were involved in this clean up – High Fernley and Woodside Primary Schools. The kids also enjoyed a game of ‘Bat and Moth’, which illustrates how bats track down food by the use of echo location. The event was kindly funded by Bradford South Community Chest. 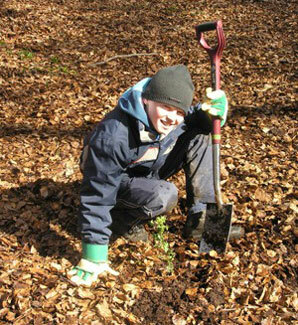 Please contact our Education Officer via info@judywoods.org.uk if your group or school is interested in environmental educational activities and opportunities. 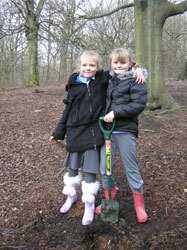 Many schools are now using the woods as part of the Forest Schools initiative. We would like to be kept informed if you intend to use Judy Woods and we can let you have supplies of our "I'm a Friend of Judy Woods" badges.